Slow cooker sweet potato and celery soup with barley is a must-have meal for a simple weeknight dinner or the perfect appetizer for Sunday supper. 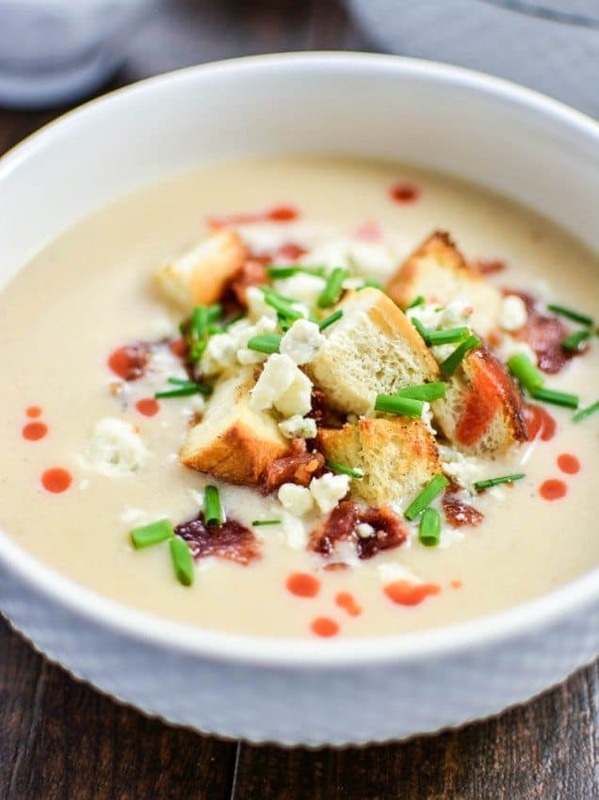 As the cooler months are upon us, fresh and hearty soups are the perfect way to warm you up on a cool day! 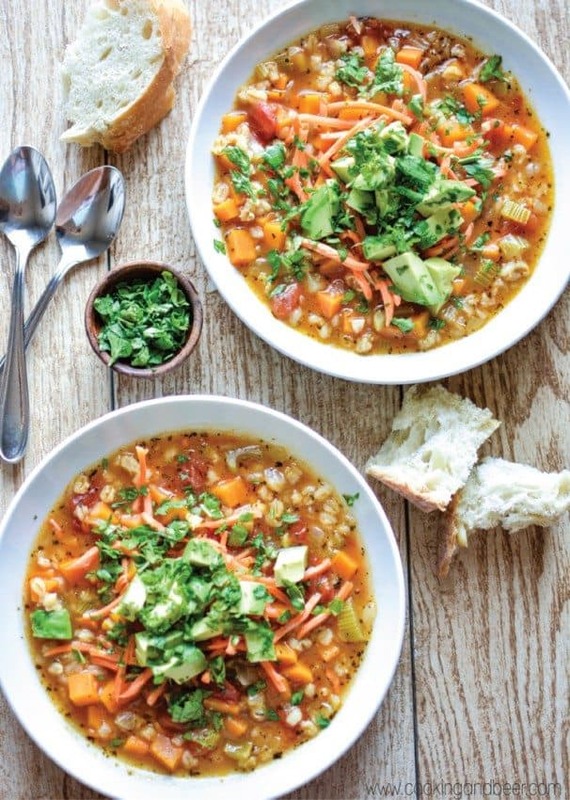 This healthy, vegetarian soup is just what the doctor ordered! Happy Thursday Melrose Family readers! 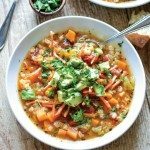 Justine from Cooking and Beer here to share with you one of my favorite ultimate comfort foods: Slow Cooker Sweet Potato and Celery Soup with Barley! I hate to be that person. The person that REMINDS you that summer is coming to an end. I mean the kids here in Wyoming have already gone back to school! I’m definitely not ready for summer to end. All of that fresh delicious local produce and warm nights on the deck with a drink will become a thing of the past. It makes me super sad. One thing I do get super excited about once autumn rolls around is the food. While I love the freshness of summer dishes, I love the comfort that comes from a warming dish on a cool day. Soups and slow cooker meals are at the top of that list, and this slow cooker sweet potato and celery soup with barley combines the two of them! Two-in-one perfection is what this soup is. Trust me. I think a common misconception about comfort food is that it’s fattening and full of all that deliciousness you don’t want to speak of the next day. You know what I’m talking about. The cream. The cheese. I could go on..and on…and on. This sweet potato and celery soup is comforting, but it’s also a healthy kind of comfort food. Loaded with veggies, this soup is what you need to keep yourself healthy through the fall and winter months. 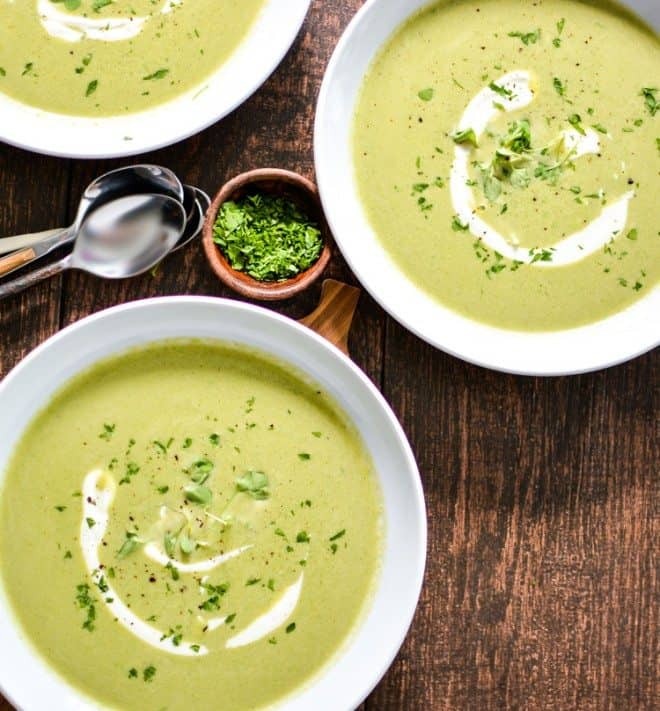 In addition to this soup being vegetarian and ultra good-for-you, it’s also soooooo easy to make too! Sweet yellow onion, celery and garlic are cooked until tender in a hot skillet. 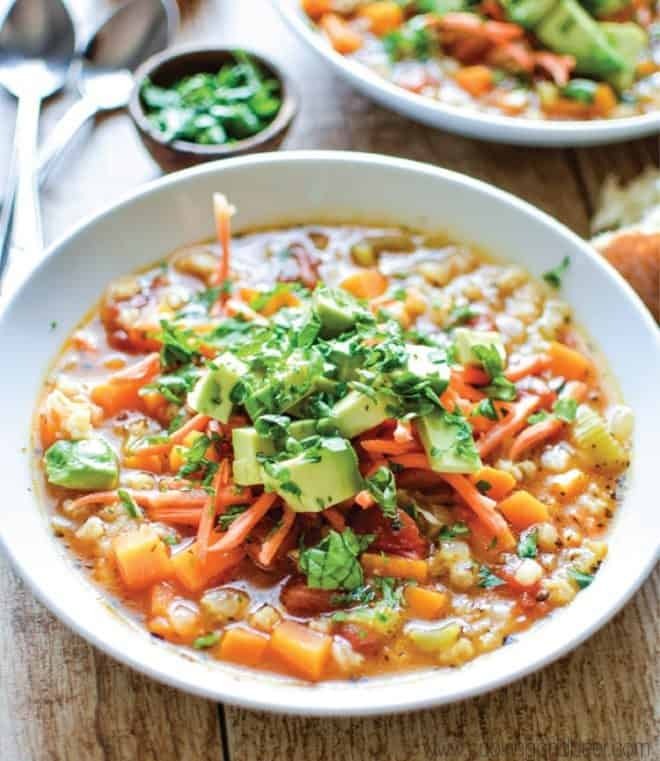 After the veggies have been transferred to the bowl of your slow cooker, sweet potato, barley and other essential soup ingredients are added along with them. Slow cooked on high for about 4 hours, the result is pure healthy, vegetarian comfort food in a bowl. Garnish with fresh avocado, carrots and parsley for added flavor and texture! I really hope you guys love this recipe. It’s one of my favorites! 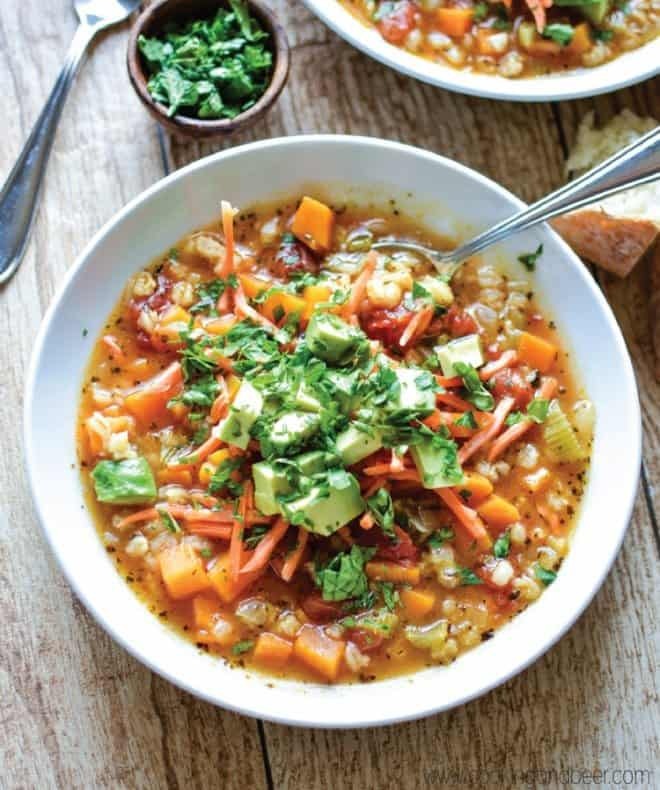 A slow cooker sweet potato and celery soup with barley is the perfect meal for a weeknight. In a large saute pan, heat the olive oil over medium-high heat. Add the celery and onion and cook until tender, about 8 minutes. Add the garlic and cook for an additional minute. Transfer the veggies to the bowl of your slow cooker. Also to the slow cooker, add the sweet potatoes, oregano, basil, thyme, vegetable broth, tomatoes, and barley. Season to taste with salt and black pepper. Cook on high for 4-5 hours or until the potatoes are tender. 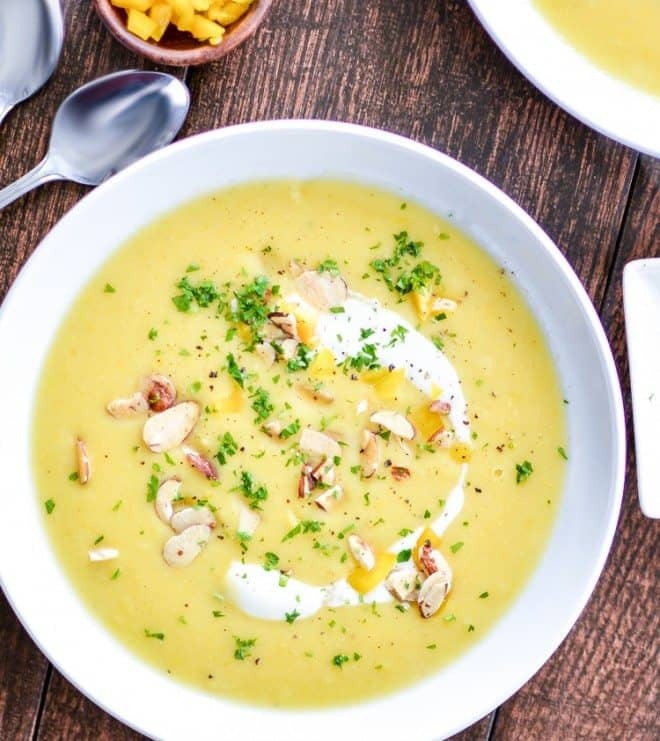 Serve the sweet potato and celery soup garnished with avocado, carrots and parsley. Enjoy with fresh bread! Like what you see today? Check out some of my other soup recipes found over on Cooking and Beer where I’m combining bold and inspirational cooking (and baking) with the best craft beer I can get my hands on!